Brushed Travertine with a chiselled edge – traditional style for a unique wall or floor design, carefully chosen from the superb Ionic Stone stock; exactly what you imagine your stone decor should look like. When you want to renovate an old home or want to recreate a rustic traditional look, then without doubt these unfilled and brushed travertine tiles are exactly what you're looking for. The chiselled edge replicates the authenticity of traditional travertine cuts from centuries ago - but without the problems of an unstable base. Suitable for wall or floor tiling the darker creamy rich colour range works well in many different designs and room-scapes. 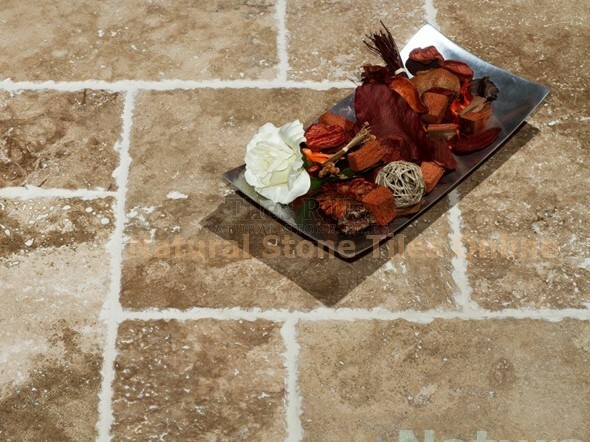 A majestic travertine tile that looks simply wonderful on floors or walls.